Otters – their irresistible appearances and humorous antics tend to endear them to animal lovers worldwide. These carnivorous little mammals belong to a branch of the weasel family Mustelidae, and they can be found in habitats on every continent except Australia and Antarctica. There are thirteen different species of otter, each species living in areas close to water, since they’re either semi-aquatic, aquatic, or marine living animals. Otters will hunt and swim in ocean waters, rivers, wetlands, marshes, streams and lakes, staying in shallower areas close to land in order to avoid predators in the water. The otter is uniquely adapted to life spent mostly swimming, and the sea otter most of all. Their long, slim physique, short limbs, webbed paws and (in most species) muscular tails help to propel them effortlessly in an aquatic environment. An insulating undercoat is protected by a layer of longer guard hairs, helping to keep them warm underwater as well, particularly since some species live in cold water habitats. Otters spend a lot of time grooming their coats and will actually ‘blow’ air into their fur to ensure a good insulating layer exists between the undercoat and top coat of fur. 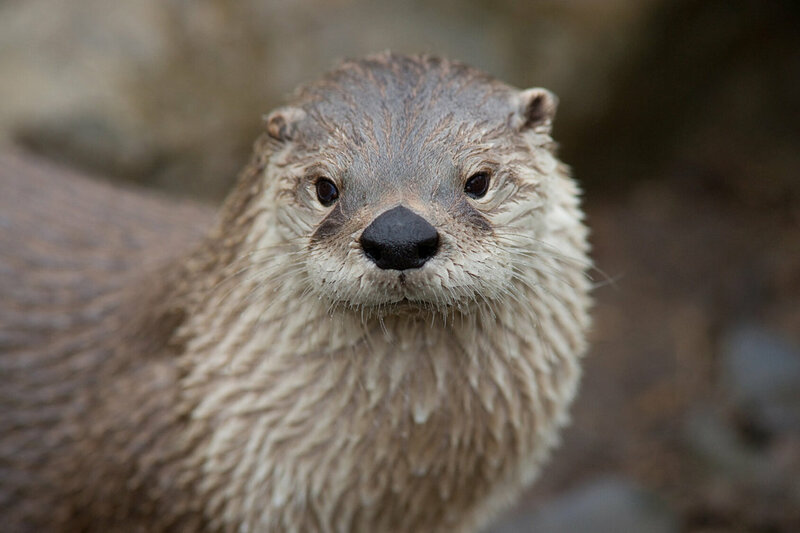 Adult otters can range from 2 to 5.9 feet in length and 2.2 to 99.2 lb in weight, with the Oriental small-clawed otter being the most diminutive otter species, and the giant otter and sea otter being the largest. It’s not unusual for otters to hunt for as many as five hours each day. Nursing otter mothers often hunt as many as eight hours daily to fulfill their nutritional needs. The high metabolic rates of many otter species means that they need to eat a significant portion of their body weight each day to help them keep warm. European otters need to eat about 15% of their weight daily, while sea otters may need to eat as much as 25% of their own body weight each day, depending on the temperature of the water in their unique habitat. These furry carnivores are active and efficient hunters, eating mainly fish but often adding frogs, crayfish, crabs, sea urchins or shellfish to their daily menu. Some otters even feed on small mammals, turtles or birds when needed. Sea otters are known to use tools - this species will carry a rock in the pouch of skin under its arm, using it to smash open the shells of crustaceans like clams and abalone. Although most otter species prefer to be in the water for a majority of the time (an exception is the river otter, which swims only to hunt or move from place to place), they build dens (called holts) on land from branches, twigs, sand, and occasionally abandoned beaver dens. These dry land territories are often generously marked by the otter with droppings to mark their habitat, leaving a distinctive smell around the area that’s been described as smelling like anything from fresh cut hay to rotting fish. The otter social structure is also fascinating. While some species live alone, others may live in a large family group referred to as a bevy, lodge, romp, or raft of otters. Groups of males and groups of females with pups tend to stay separate, with males and females usually only interacting to mate. Otters are very playful, too. They can often be found playing chase with one another, wrestling, and sliding down hills or snow into the water, purely for the sheer fun of it. These lively little mammals can become ready to mate anywhere from two to five years of age depending on species, and have a gestation period of 60 to 86 days before pups are born into the den. Sea otters only tend to give birth to one pup at a time, while other species may have up to five pups in one litter. Newborn otter pups are cared for by the mother, and although they’re able to swim on their own after a few months, pups generally tend to stay with their family group for the first year of their lives. Sea otter pups in particular are cared for very closely, resting on their mother’s chest to sleep and feed, or, when the mother needs to hunt, left wrapped in a bed of sea kelp to float safely on the surface, since their extremely buoyant coat doesn’t allow them to dive until they’re older. Although there are some differences from species to species, otters have an approximate lifespan of up to 16 years. Because of their luxurious, dense coats, some otter species have historically been hunted for their pelts to near extinction status. Poaching, pesticide use and habitat loss also threaten otter populations around the world, and in areas like the Amazon River basin, toxic pollutants from mining affects natural waterways where otters live and hunt. Some otter species have been extended environmental protection, particularly sea otters, and some populations are gradually increasing again from dangerously low numbers. In Bangladesh, smooth-coated otters are still bred and used by fishermen to drive fish into their nets, although this practice is becoming far less popular with the introduction of technology that makes fishing more efficient.